It is a pleasure, a blessing and an honor to bring Jolly Notes to you daily, by God’s grace. We are truly grateful to God and to each of you for making this possible. We are constantly thankful to hear how people are being blessed. Praise God! Unfortunately, the reality is that running Jolly Notes is very costly in both time and money. If you are willing/able to, please prayerfully consider supporting this ongoing work via a one time or recurring contribution. Thank you very much for your support! You can also support Jolly Notes by sharing JollyNotes.com with your friends, family members and loved ones!!! 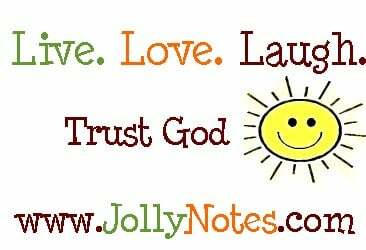 Most important of all, kindly keep JollyNotes in your prayers – That this site will continually be a useful tool in God’s hands, to bless and encourage people all over the world, to draw people deeper into God’s love, always to the glory of God.